Persistent Fetal Vasculature (PFV), also known as persistent hyperplastic primary vitreous (PHPV), is a congenital developmental disorder that occurs when the vascular structures present during the development of the eye fail to wither, or regress, as they should. The resulting structural abnormalities may lead to impairment of vision. An understanding of the vascular anatomy of the developing eye is helpful in making sense of the ocular findings. There are two components to fetal vasculature: the vascular meshwork that surrounds the lens during development (tunica vasculosa lentis), and the vascular connection of this lens meshwork that extends back through the gel filling the back part of the eye (vitreous) to the entry point of these vessels into the eye at the optic nerve (hyaloidal system, or primary vitreous). Both the tunica vasculosa lentis and hyaloidal system are present during development but normally wither away before a pregnancy comes to term at 40 weeks of gestation. The findings in an eye with PFVS will depend on whether one or both of these components of the fetal vasculature is affected, and to what degree. 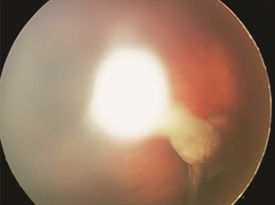 The disease itself is usually not progressive, but as the eye grows, the abnormal structural components of PFVS do not grow along with it; traction from these abnormal tissues on structures within the eye increases, and progressive changes may occur. The spectrum of eye conditions in PFVS is broad, and often become apparent at birth or shortly thereafter. Crossed eyes (strabismus), abnormal eye movements (nystagmus) and “lazy eye” (amblyopia) are common features. Eyes with PFV are often smaller than normal and commonly only one eye is affected—although there are instances in which the eyes are normal in size, or where both eyes are smaller than normal. PFVS falls into the group of ocular diseases in infancy characterized by a white pupil—a result of the abnormal tissue behind the lens (Figure 1)—termed “leukocoria.” While the findings of PFVS are typically restricted to the eyes, other conditions with the findings of leukocoria may be life threatening. The most important disease to rule out when a child presents with leukocoria is retinoblastoma (a rare malignant tumor of the retina). Typically, if one is able to visualize the back of the eye, a stalk is seen spanning the space between the optic nerve and the back of the lens (Figure 2). If the view into the back part of the eye is challenging, ultrasound and/or CT/MRI scans are often performed. For the typical child with PFVS who has leukocoria noted in one eye shortly after birth (after retinoblastoma is ruled out) surgical intervention should be considered for this visually significant disease. It is rare for an eye with PFVS requiring surgical intervention to be restored to normal vision. However, the anatomy and function can often be improved and the eye typically grows more normally with surgery. Most commonly the lens is removed, and on occasion surgery is also done to reattach the retina. 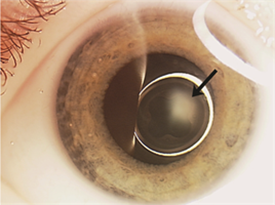 Replacement of the lens function typically requires use of a contact lens postoperatively, and patching therapy to minimize amblyopia is the norm. James B. Byrne Jr. M.D. Edgar L. Ready IV, M.D. 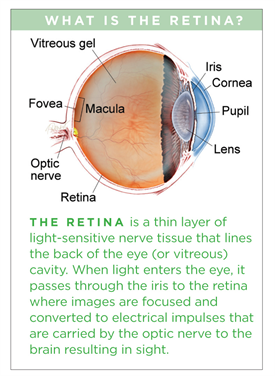 The Ophthalmologists at Retina Specialists of North Alabama are dedicated to providing state of the art medical and surgical treatment of your retinal problems. We are available 24/7 to help you and your loved ones minimize the effects of serious vision problems as quickly and effectively as possible.